The National Union of Imo state students (NUISS) inauguration holds on Saturday, 8th December, 2018 at IMO international convention centre (IICC), Owerri by 11am, Imolites and indeed the general public is invited. With the theme: "Education, a Panacea to good Governance", Officials of NUISS from her 73 chapters of 73 institutions of higher learning and indeed the entire Imo State Students and well wishers will have another opportunity to converge in owerri after her national convention on Friday Nov. 30th. Expected guest speakers for the inaugural lecture are: Prof. Adaobi Obasi; Vice chancellor of Imo state university. Dr. Ifeanyi Ekenasi; USA trained Educationist. Ugwumba Uche Nwosu; National patron, NUISS. Prof. Mrs. Edna Njoku; Senior lecturer, FUTO. Under the distinguished chairmanship of Hon. Kingsley Uju Chima State Patron of NUISS. Special guest of Honour: His excellency, Owelle Rochas Okorocha, Executive Governor of Imo state / National grand patron of Imo state students. Chief Host: Hon. 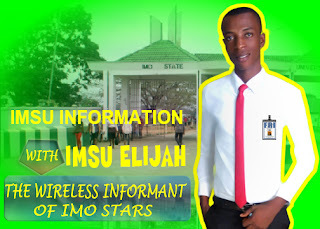 Godstime Chukwubuikem Samuel; DG, Bureau of students affair, Government of Imo state.